Find out about Arlo and his dino family, and meet his new best friend, Spot! Stick in photos of your own friends and family, and create your own wild adventure. 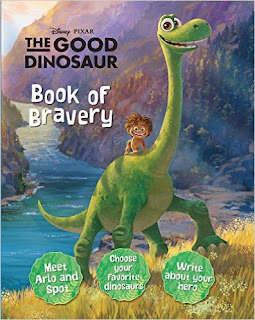 Disney Pixar The Good Dinosaur Book of Bravery (All about Me) by Parragon Books is an adorably cute way for children to create a book that's all about them. Kids can add in photos of themselves and their family to create a family tree of their own. Kids also get to write all their favorite things that they love and preserve their favorite memories in this cute little keepsake book. This is the perfect way for kids to create something that can be treasured by both parents and kids alike. Disney Pixar The Good Dinosaur Book of Bravery (All about Me) by Parragon Books is a terrific book! You can find Disney Pixar The Good Dinosaur Book of Bravery on Amazon, Barnes and Noble and other bookstores.